This was a delicious surprise. (Sorry about over-using the adjective “delicious.”). Finely chop the pears and place in a large saucepan. Add sugar, lemon juice and vanilla bean. Bring the mixture to a boil and stir gently. Boil rapidly, stirring often, until jam is set (around 20 minutes). To test if the jam is set, remove the pan from the heat and place a teaspoon of jam on a chilled saucer for two minutes. A skin should form on the surface of the jam if it is set. If not, keep cooking and stirring. Once you deem the jam is set, add the chocolate and bring the mixture back to a boil until chocolate is melted. Store jam in an airtight, heat-proof container and allow it to completely cool in the refrigerator. Store jam for up to one month. 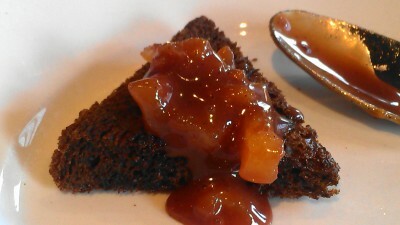 Instead of English muffins, this chocolate pear jam was served on rye toast triangles. The savory rye bread worked well with this super sweet jam. I can’t wait for pear harvest! You will not believe what is next: Chocolate Raspberry Cupcakes with Milk Chocolate Earl Grey Buttercream. I see chocolate jam scones in my future. MMMMM. Good idea and use for this stuff! Two thumbs up for this delicious jam! Thanks, Katerina. I think I will make it this fall with fresh pears and dark chocolate. I have never had a jam made with a combo of pear and chocolate. Fascinating! I had never even heard of anything like this! We just planted a “three-in-one” Asian pear tree. I hope for some pears in the near future! I got a couple of Asian Pears for Christmas and so I worked them up and then put them in the freezer – I have chocolate – hmmmmmmmmm………..betcha’ I’m making this on the weekend! If I get to it I will post pix! Really? Chocolate in a jam! Now that’s ingenious! I do love this jam! Thanks so much for sharing it. Serving it on rye toast is very interesting. It was delicious. This actually has me thinking about a dark sweet cherry-chocolate jam. Thoughts? Hey gal, I hope you had a wonderful Easter. This jam is seriously yummy sounding. I never think about adding chocolate to jam. Pretty much the herbs are as wild as I have gotten. What kind of chocolate did you use? Chef Sarah used milk chocolate but I am going to try dark chocolate as soon as I can get some pears (but I am thinking I will try some dark sweet cherry jam with chocolate next)!